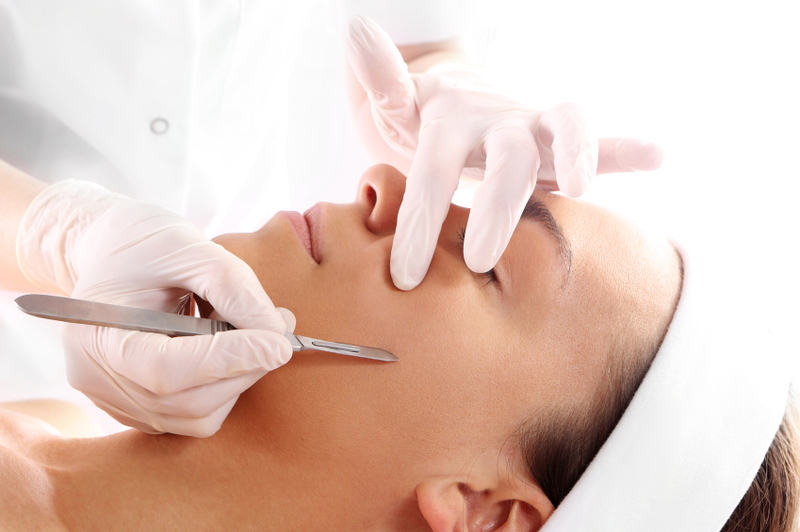 It’s called DERMAPLANING and it is essentially a form of shaving! And everyone knows that a woman should never shave her face!! 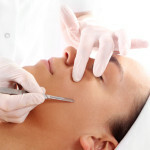 Dermaplaning is an esthetic service that serves to deeply exfoliate the skin. It is performed with a scalpel which gently sloughs off the superficial top layer of the epidermis. In addition, the action of the scalpel against the skin will result in the removal of all the fine peach fuzz hairs that exist on the face. Since makeup artists love the smooth surface for the easy application of foundation, etc., they are very much in favor of this but don’t understand the repercussions. Before undergoing this service, many women ask if their fine facial hair will grow back more abundantly. They are told that this is “merely an old wives’ tale” and that the hair will grow back exactly the same as before the procedure. Absolutely not true! Those fine little hairs will eventually be stimulated to grow back darker, longer and denser. As an electrologist, I’ve seen this scenario all too often when women shave, wax and thread their faces. Many years ago, I performed electrolysis on a beautiful young woman who had been a fashion model as a teenager. Her face was shaved repeatedly in order to obtain the smooth, polished look that her photographer and makeup artist wanted. As a result, she experienced a huge increase in growth all over her face and needed extensive electrolysis treatments to eradicate it. More recently, I am seeing a number of new clients who have had dermaplaning and are now also plagued with an abundant amount of visible hair growth over their entire faces. Please DO NOT believe everything you read on Internet, Facebook, or in beauty magazines. Trust the words of this experienced hair removal specialist (me) who has witnessed firsthand the frustration, confusion and desperation of women who deal with embarrassment of unwanted hair growth. If you are intent on getting a peel, seek an alternative treatment! PCOS is a hormonal imbalance that can affect a woman’s body in a variety of upsetting ways such as excessive hair growth, infertility, weight gain and more. It is the most common endrocine disorder in women. Please share this information with other women who may be confronting excessive hair growth as well as other hormonal issues. Visit the PCOS Diva to learn more about how Amy Medling can offer support to those with Polycystic Ovary Syndrome. This post is dedicated to all the wonderful women who have visited my office for electrolysis treatments. You are a great bunch and I am honored to have had the opportunity to work with you. I thought it would be fun to write a parody of the typical personalities that I treat. Let’s assume that the following Dwarf Divas are having electrolysis on their faces. Which one are you? Let me know by leaving a comment in the box below. Enjoy! SNEEZEY This Dwarf Diva has a strong tendency to sneeze whenever I perform electrolysis on the upper lip and/or the center of the eyebrow. “Sneezey-A” emits tiny little sounds from her nose that are barely audible. “Sneezey-B” is another story altogether. 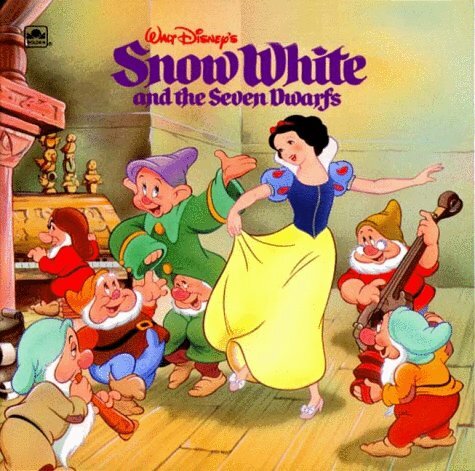 When this particular Dwarf Diva sneezes, I often fear that all my office essentials along with the wall decor will be blown right out of the room! TEARY This Dwarf Diva always has a tissue in hand. “Teary-A” does a good job of squeezing her eyelids together in order to prevent tears from escaping until our session concludes. “Teary-B,” on the other hand, has a copious stream of tears which form a little river down her cheeks and threaten to create puddles in her ears. STOIC When this Dwarf Diva is on my table, she is as motionless as a statue. Her breathing is barely perceptible and she doesn’t utter a sound. I sometimes fear that perhaps she has lost consciousness…or worse! MONA This little Dwarf Diva releases a moan, a groan and a chirp for each and every follicle that is treated. It’s a very entertaining and musical session with lots of body movement on my treatment table! CHATTY When this Dwarf Diva is undergoing facial electrolysis, she often pulls away to converse with me. As soon as I reposition her head, the movement begins anew. I may not succeed in treating as many of her hairs as I’d like, but the time goes fast as the conversation continues! RELAX This Dwarf Diva greatly looks forward to her electrolysis sessions. She gets to lay down with her feet up while taking a very needed break from the stresses of her day. She often comments that her electrolysis sessions are “like therapy” as they are super relaxing. SQUEEZER My last Dwarf Diva is a major squeezer. In order to get through her treatments, she can be seen twisting her clothing into a wrinkled mess, squeezing her hands together so tightly that the blood ceases to circulate, or holding some other comforting object that she can manipulate and distract herself with during the session! THE COUNTESS This Dwarf Diva spends her session counting each and every hair that is treated! EARS As the name suggests, this little diva begs me to distract her with stories about my life. No doubt, she knows most (if not all) of my secrets! Women are faced with a myriad of different options when dealing with unwanted hair growth and how to eliminate it. 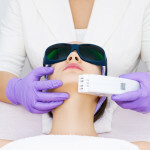 In particular, there is a lot of confusion when it comes to understanding the differences between laser hair removal and electrolysis hair removal. The laser beams a highly concentrated light through the skin with the goal of targeting the hair root. 1. PIGMENT – The best chances for success with laser hair removal are achieved on light skin with very dark, thick hairs since the laser works by targeting pigment. Laser is NOT recommended for individuals with dark skin since it cannot differentiate between the hair color and the skin tone, so the danger of burning exists. Also, it is NOT recommended for women with light skin and light hairs since there is no pigment for the laser to target. 2. DENSITY – The greater the amount of dark hairs in a given area, the better the potential for reduced hair growth (i.e., armpit, bikini area, etc.). Refer to the above information on pigment to determine if you are a candidate. 3. SKIN THICKNESS – Thin skin tissue is required for the laser light to penetrate deep enough into the skin to reach the hair root and destroy it. Many women with light skin and dark hairs have good results on the bikini area since there is dense hair growth and the skin is thin. Electrolysis is performed using a thin wire that is gently inserted down the shaft of the hair follicle in order to concentrate heat on the hair root. 1. PIGMENT – Electrolysis can be performed with great results on any skin color, any skin type and any hair color. 2. 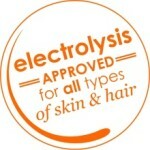 DENSITY – Not a requirement for the success of electrolysis treatments. 3. SKIN THICKNESS – Thin or thick skin can be treated with equal success. If you have fair skin with dark dense hair growth, this would make you a good candidate for successful laser hair removal treatment. Best results are in the bikini area. Depending on the amount and distribution of hairs, there may also be some improvement on arms, legs and armpits. Keep in mind that laser becomes less and less effective as the hairs thin out. When this becomes the case, it would be advisable to complete the job with electrolysis. Women should NEVER do laser on the face. It is especially dangerous when performed near the eye area and it may possibly harm the teeth and gums when it penetrates the thin skin of the lip. 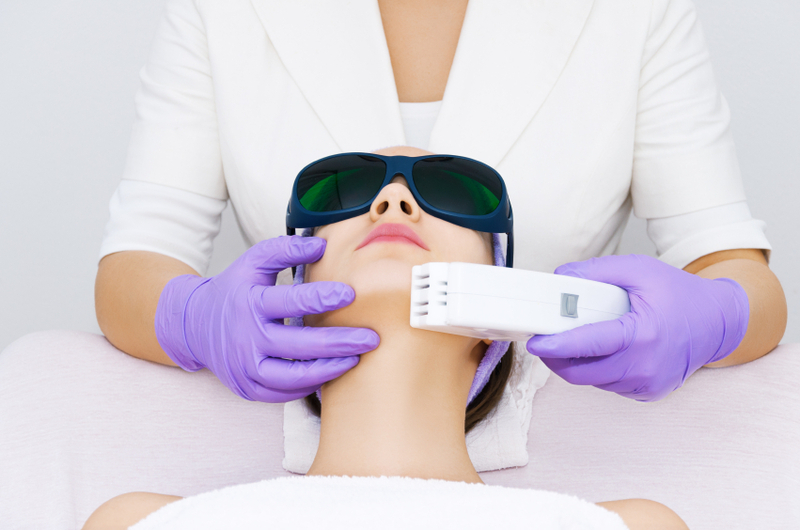 Additionally, women are finding MORE hair growth on their faces after having had laser hair removal. This phenomenon is known as “hypertrichosis” and is caused by an increased blood supply to the hair root due to the heat of the laser. Laser hair removal is a relatively young technology so it is too soon to know the long-term consequences of repeated treatments. The word LASER is an acronym with the “R” standing for “radiation.” I wonder how many times can a single area be exposed to the light of the laser without causing damage to the cells. Additionally, it should never be done near the eye area. It has been reported that side effects include “damage to the iris, inflammation of the eye and irreversible cataract.” That said, I believe that the legs and arms may be the safest areas to have laser treatment. I would be cautious, however, when considering work on the armpit and bikini area due to the existence of lymph nodes in those areas. When choosing laser hair removal, ask a lot of questions so that you can be an educated consumer. Electrolysis has been around for over a 100 years. It has withstood the test of time for safety. Furthermore, it is the only method of hair removal that has been approved as “permanent” by the FDA. When choosing electrolysis, remember that your selection of a competent, experienced electrologist is paramount to your permanent hair removal results.